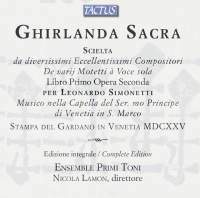 ‘Ghirlanda Sacra’ (Venice, 1625) is an anthology of 44 motets for solo voice and basso continuo compiled by Leonardo Simonetti, a castrato in Monteverdi’s choir at St Mark’s. Almost all of the composers selected were based in Venice or the Veneto, including the usual suspects (Monteverdi, Grandi, Rovetta, Barbarino) but also many less familiar contemporaries; Cavalli’s Cantate Domino is included under his real name, Pietro Francesco Caletti Bruni. Trombonists might recognise the name of Dario Castello but the dance-like Exultate Deo is his only piece of vocal music that survives. Nicola Lamon revolves between six different singers and varying combinations of continuo instrumentation in order to enhance textural variety; the simplest combination of voice and just theorbo and keyboard proves to be the most natural and persuasive. Bartolomeo Barbarino, and Diana Trivellato sings brightly (and often sharp) in Jubilate Deo by the 13-year-old St Mark’s chorister Domenico Obizzi. There is greater declamatory presence from the impressive tenor Raffaele Giordani in Hodie apparuerunt delitiae paradisi by Giovanni Pietro Berti (second organist at St Mark’s). Countertenor Jacopo Facchini is mildly unsteady at times but gives fluent performances of Regnum mundi by Giulio Cesare Martinengo (Monteverdi’s predecessor at St Mark’s) and O bone Jesu by Giovanni Maria Scorzuto (which unusually has written continuo interludes). Ensemble Primi Toni also throw in some short instrumental introductions by Gabrieli and Kapsberger. There is something to be said for the straightforward warts-and-all honesty of the natural sound, and this is a useful reference tool for early-17th-century Venetian church music beyond Monteverdi.